“Influence & Impact” – Our 15th year celebration! 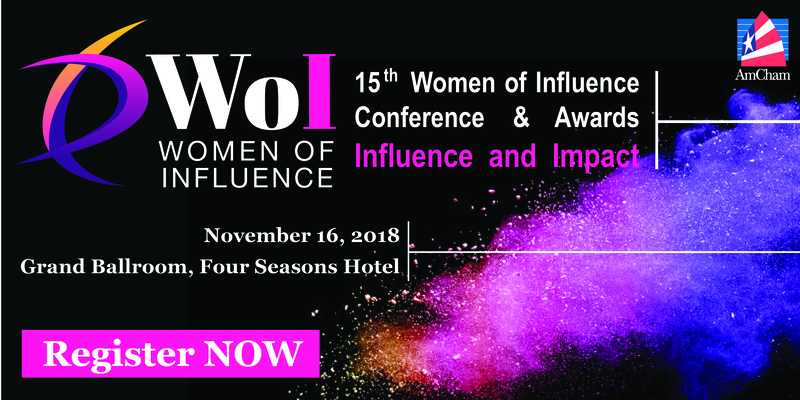 The American Chamber of Commerce Women of Influence Awards are celebrating 15 years on November 16th 2018 with a phenomenal line up of speakers and award winners reflecting on the concepts of “Influence” and “Impact”. This year we will examining what it means to have influence and impact through the stories and experiences of key global and local leaders as well as sharing the secrets on how to make a personal impact and the cultural factors that impact the progression of women in corporate environments. This marquis event at The Four Seasons Hotel in November promises to be a thoughtful and inspiring celebration of the wonderful achievements of the Women, Men and Companies in Hong Kong that are committed to driving gender equality and furthering the development of a more balanced and equal working environment for all. This event attracts annually over 300 professional women and men attending morning and lunchtime keynotes, panels and break-out sessions. The heart of the event celebrates the announcement of the 15th Annual Women of Influence Awards, with nine award categories will recognize and award seven high-achieving women, one man who has demonstrated support for the advancement of women and one outstanding company for women. Join us for the women event of the year in Hong Kong where we continue to honor and build on our mission to promote professional women’s leadership and aim for gender parity in the workplace in Hong Kong and Greater China. It’s a day to promote our progress and to explore what it means to have an impact and to be inspired!